Buzz deserves on a pat on the pack; he’s been through two generations of party games now and is still churning out entertaining games that are perfect for a night in with a few friends. Buzz: The Ultimate Music Quiz is no different; using the Move controller means there’s a perfect mix of both classic and new games to try out in this tightly presented package. 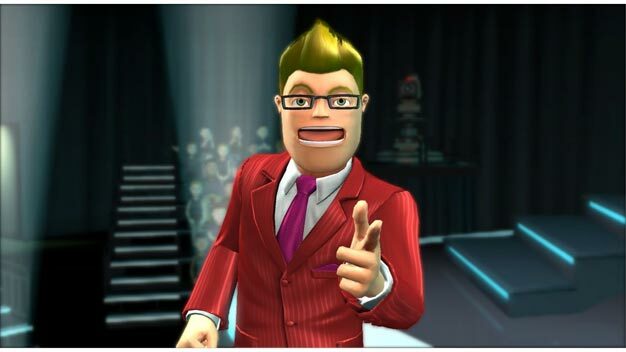 The first thing you’ll notice if you’ve bought any previous games in the series is that Buzz has had a little bit of a makeover this time around with developer Relentless Software giving him a more human look. To be honest, I miss the huge-faced, cartoony Buzz that used to heckle the other presenters, and then trip over in front of the audience, but it’s not the end of the world. At least the player avatars keep their wackiness. Picking one of the characters from the list of Darth Vader rip offs and Mexican Wrestlers shows off the game’s own sense of comedy pretty well. You can even use the Eye to stick your face on the characters this time, making for some pretty odd looking folk. With your character set up you can either create a Move game or a classic game using the Buzz controllers. 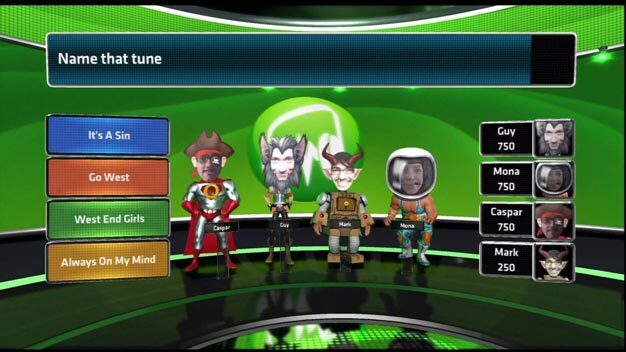 Move games will use the Eye camera to show the whole room and transform your controllers into darts, hammers, even giant magnets that you’ll use to pick answers with. It’s a refreshing change for the series and a great new way to play. A frantic match that sees everyone trying to slam the right answer with their hammer is pretty funny and one of the best party/social experiences with the Move yet. A classic game works around a variety of different game types and can last anywhere from 15 to 45 minutes. There are a few old classics like Point Builder where you have just answer questions and then a fresh mix of new games that see you racing to fill up a thermometer by answering questions first or fighting with your opponents so you don’t get chucked into a pool of gunge. It’s a perfect mix that makes this the most entertaining Buzz yet, and definitely something I’ll continue to play when my friends come around. One small problem is that with all these improvements it’s a shame that the questions are focused solely on music. Now, I know my Beatles from my Beastie Boys but it wasn’t long before I longed for a few more questions on other topics. If this had been a simple update like prior Buzz games then I guess I’d have no problem with it, but this is the best Buzz setup yet and it’s only going to appeal to you if you’re clued up on music. Film buffs and gaming nerds won’t be able to exercise their knowledge which is a real shame and will hopefully be corrected with DLC/add-ons soon, and to be fair, there’s a huge range of music covered in the questions. You’re bound to be quizzed on something you know about at some point. The game does retain its presentational standard, which is pleasing to see. The visuals, while not exactly demanding are pretty sharp and give off the feeling of watching a Saturday night quiz show very well. Buzz brings his usual voice work to the table yet again, bluntly insulting the announcer when you skip over the instructions and generally making an amusing fool of himself. He might not be creating his own levels or blowing up trains in the Himalayas, but the guy’s actually a pretty friendly face to represent PlayStation. Buzz: The Ultimate Music Quiz is has got all its bases covered; a bunch of questions, a likeable presentation and a perfect mix of Move and classic games that make this a fun refreshing title to enjoy with friends. I’d like to see the new format cover a wider range of topics but that’s sure to come in time. Relentless have done a good job breathing new life into the franchise with this one.